It is coming to that time of the year that I start to get rather concerned about reducing expenses. With the holidays coming, my reselling business will become a prime focus, however I never try to lose sight what we’re paying for the credit card benefits we are getting. So with that, in a post similar to Joe’s “Annual Fee reduction” post, I’ll cover the cards that both my wife and I are carrying and what we plan to do about them. Disclaimer: Primary cardholder benefits may not be exhaustive lists, as these benefits are well covered elsewhere. 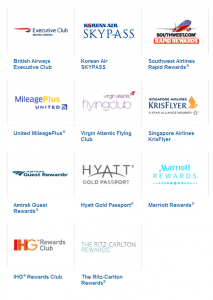 50% more value when redeeming Ultimate Rewards Points for travel (e.g. 1.5 cents per point). $300 Annual Travel Credit – Automatic vice AMEX. Verdict: Likely not a keeper, assuming another card provides Primary Car Rental Insurance, like the Chase Ink Plus. 35% points reimbursement when paying with points for premium tickets (or any class on your selected airline) – note, I’m grandfathered in on the 50% points reimbursement that ended a few months back. A bunch of status – National, SPG (which translates to Marriott), Hilton. Verdict: Not worth it, unless I’m missing something. A $250 Air Travel Credit – Automatic vice AMEX. Complimentary 4th night free on hotel stays of 4 nights or longer. Verdict: Possibly worthwhile if the authorized user gets the travel protection; also cheapest Priority Pass Select. I realize this isn’t an exhaustive list. There are other great premium cards out there, like Chase’s Ritz Carlton card, Bank of America’s new one, and the Citi AAdvantage Executive–which I already am an authorized user on–and a few others from American Express. Rather, I wanted to look at the big three, and I have to be honest. I’m having a hard time seeing the value of an authorized user on any of the cards. Its a shame, because I’ve been really enjoying my Chase Sapphire Reserve. 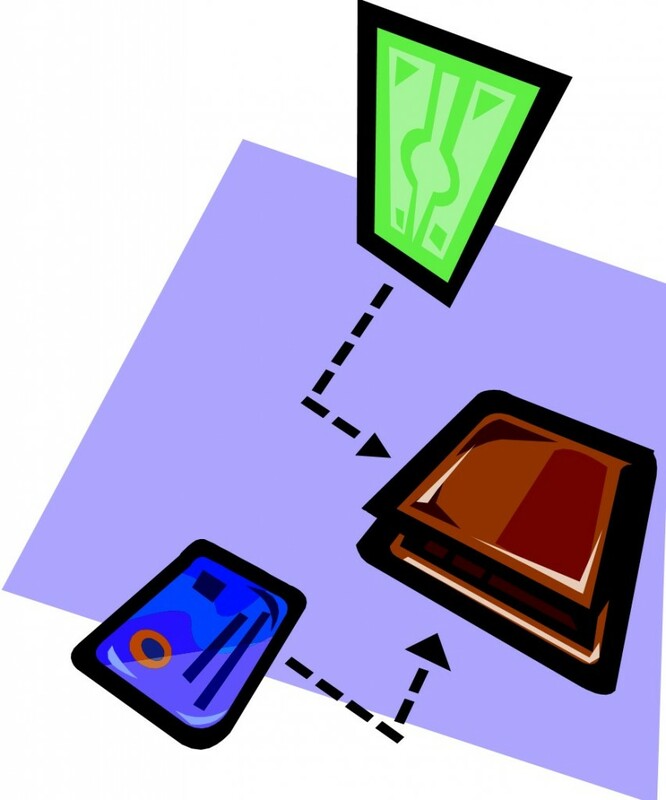 Is it time to get more strategic about credit card applications? In the past few months, we have seen a bunch of developments. We’ve seen greater restrictions, great new sign on bonuses, but, yet still, a new churnable credit cards. Is it time for a different strategy for credit card applications? Three of the big credit card issuers have made rather meaningful changes to how one receives bonuses, or whether one is approved at all. September, 2016: Chase briefly puts in writing, the 5/24 rule; despite considerable additional discussion. The fact is, it is getting harder to churn sign-on bonuses. Chase Sapphire Reserve, an amazing card (though maybe not a daily use card for resellers–But I cover all the key benefits of the card, so check out the link! ), with a 100k Ultimate Rewards point sign-on bonus. In response, American Express Platinum added 5 points per dollar on airfare. Note, this personal. AMEX didn’t stop there, the American Express Platinum two new benefits (1.5 points per dollar on purchases $5k or more, and 50% back on “pay with points” airfare), and a 100k Membership Rewards sign-on bonus. Sound similar to the Chase Sapphire Reserve? American Express, this time with its Delta offerings increased sign-ups for the Platinum Sky Miles Card to 70k, and the Gold Skymiles Card to 50k. Chase recently confirmed a new business offering, the Chase Ink Preferred (sound familiar? ), with an 80k Ultimate Rewards point sign-on bonus. Based on what is currently available, my read, is that it is an inferior card, with 3x on up to $150k spend in categories which I see no feasible way to spend $150k in. All indications point me toward the thought that this is not the end. We are still waiting to see what Citi will do with their devalued Prestige offering. I think we might also see a new Chase Business Card, as Doctor of Credit implies when he reports on the Chase Ink Preferred (link above). We might also see a new offering from American Express, although I anticipate it would be difficult to create a new offering without devaluing the Platinum cards. Okie, we’re pretty weak here, I’ll admit, but there are a few churnable credit cards that may make sense. Bank of America’s Asiana Visa – 30k bonus after $3,000 spend. Have another each month (or so I’m told). Bank of America’s Virgin Atlantic card, get 90k after a year and a bunch of spend. Believe me, this is one I’m considering, given Greg the Frequent Miler’s enjoying his Necker Island Challenge, and by the way, his comment of not expecting Richard Branson being there — he was welcomed to the island by Richard. I have to wonder if Greg brought up that complaint letter. So, yeah, the pickings may be slim here, but, for some, that may never have had a Delta AMEX (me!!! ), there are other cards that are quite tempting. My point in this post was my attempt at working out my own credit card strategy over the next 18 months. Normally, I work in 18 month timeframes, it seems like a reasonable balance between one and two years. Of course, 18 months used to be the magic number with Chase and Citi, that is changing to 24. So what is my conclusion? Given that my wife and I play the two player game, I might apply for cards, and let my wife sit on the sidelines–or vice versa, depending on her preference. The challenge here though, is the fact that there are some cards that just make too much sense to pass up, like the Chase Sapphire Reserve, when it was briefly leaked, which both my wife and I were successful with. So, yeah, I’m not sure what I’ll do if another Chase Sapphire Reserve-like offer comes about, but, barring that, I’m thinking its going to be the two-player game. You have by now–I hope–no doubt heard that Costco no longer accepts American Express. In fact it is now a Costco Visa world. While I shed some tears, as I got a ton of spend on my American Express Starwood Preferred Guest (SPG) Business card at Costco over the past years, I also look positively to the future. In that vain, there are winners and losers–as in any situation. 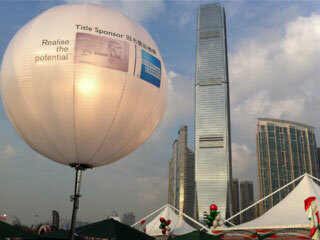 American Express, the long time Costco partner, recently lost that partnership to Citibank and Visa. The details of how that happen, to this day are a bit obscure. Gary Leff has an account, Long story short, it sounds to me like Costco treated this like any other business transaction–like procuring ketchup–and American Express expected more loyalty from a long time partner. The fact is, Costco is a pretty open book business. In fact, this article reports that the general rule is to only mark up 15% or less. I remember vaguely that 8% was the rule in some cases. The fact remains, American Express lost a great partner that had a huge following, and Citigroup and Visa won that. Now, you should definitely check FrequentMiler’s link out, but I’ll share with you – he doesn’t think this Costco Anywhere card is the best cashback card. Neither do I, but, his conclusion and my conclusion are different–thus why you should check out his link. While this should have been clearly apparent on day one of Costco Visa, it wasn’t, to me. Perhaps I was still in denial about not being able to use my AMEX SPG Business card–after all, SPG points are awfully nice. Or perhaps I was just trying to re-calibrate to the new Visa world. But luckily, a small credit card issuer invested in a billboard to help me see that even without the Costco Anywhere card, I too was a winner! Chase Freedom’s Warehouse Club–read: Costco–Billboard – unfortunately didn’t come out well with my iPhone6. You see, Chase, in their wisdom, saw Citi’s potential winner’s folly (H/T View From the Wing), as a huge win. 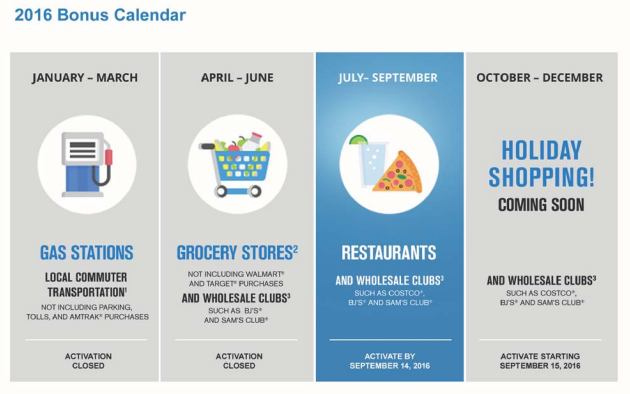 They changed their Chase Freedom’s rotating 5% cashback–or if you have a Chase Sapphire Preferred or Chase Ink, 5x Ultimate Rewards Points–for the remaining quarters of the year, to include Warehouse Clubs. They are advertising heavily–reference graphic above. In short, Chase sees the amazing hand that they have been dealt, and are leveraging it mightily. American Express lost. Citibank and Visa won–in theory. But I would propose that Chase is the true winner. 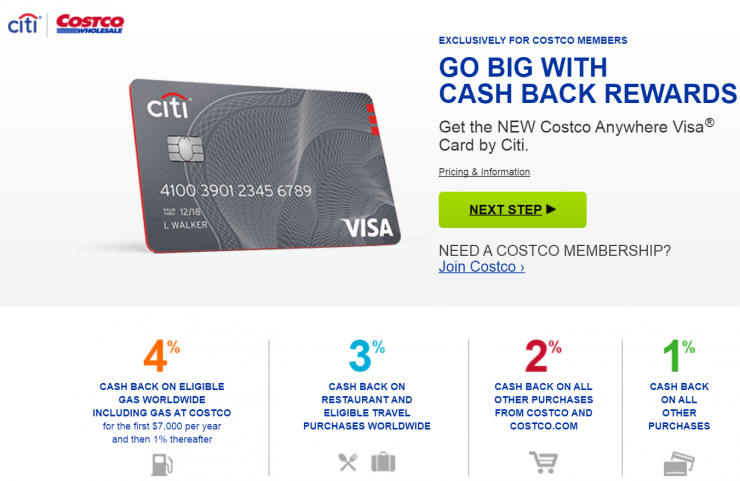 Have you gotten the Citi Costco Anywhere Visa? Or used your Chase Freedom at Costco yet? Who do you think the winner is? 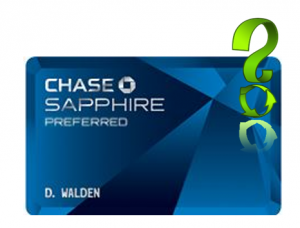 Is the Chase Sapphire Preferred worth keeping? Earlier this week I shared what credit cards I keep in my wallet on a day to day basis. One card that reader Shannon commented that she had cancelled her CSP in favor of the Barclay’s Arrival. That got me thinking even more (because, I had been thinking about cancelling before). A few months ago, my wife downgraded from the Chase Sapphire Preferred down to the Chase Sapphire. We haven’t really experienced any real impacts, because she still has 2-3 Inks so she maintains the ability to transfer Ultimate Rewards (UR) points to airline partners. 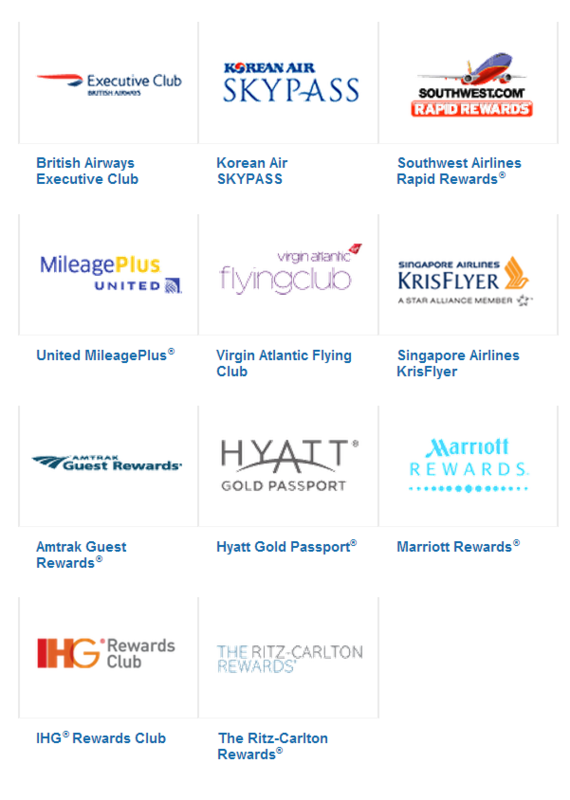 I figure everyone knows this by now, but a reminder that Ultimate Rewards points can be transferred to a ton of travel partners never hurts. Chase Ultimate Rewards Transfer Partners. Needless to say – it is always a good thing to keep the ability to transfer UR points. Are the benefits worth it? Double the trip cancellation / interruption insurance (now $10k) ($5K with Ink). My card doesn’t come due until next March, so I might get my 7% dividend, but lets be honest, it won’t be much. Really, when you think about it, your opportunity cost for using the Chase Sapphire preferred is a minimum of 0.06% if you compare it to the Barclay Arrival (as many do). You might say that UR points are move valuable than cashback. Ok, but, then why aren’t you getting 5x instead of 2.14x? If we pull in the time-value of money, then waiting for that dividend is even worse of a deal. So while I will try to milk the last bit that I can, I really can’t justify the annual fee. Ed. Note: No affiliate links were included in this post and no blow torches were used on unsuspecting Chase Sapphire Preferred cards. Whenever I grab lunch or a drink with a friend or colleague, I find myself curious of what card they choose to use and why. It kills me if they use cash, but, I digress. So, I thought I’d offer what is in my wallet with no links (affiliate or otherwise), because I think its a meaningful conversation to have. Below I lay out what I believe are the best credit cards for miles and points residing in my wallet and why. So, What’s in my wallet? Chase Sapphire Preferred – I use this for dining (except on first Friday, because that would be so pas se) I also use this for travel costs, to include occasional overseas charges. British Airways – I feel like I get good value, at 1.25 Avios points per dollar spent, but increasingly I’m wondering if I’m better just putting those charges to my Starwood Preferred Guest. Starwood Preferred Guest (SPG) Personal – 1.25 SPG points for all spend, assuming I can transfer points in 20k increments. Its an easy card to rely on, but not my lead-off card, to use a baseball analogy. Chase Freedom – 5x quarterly rewards. This quarter its Gas stations and Kohls. It generally spends 4-5 months of the year in my wallet, when I’m home, just so I can hit the $1,500 to get the most of the 5x Ultimate Rewards (UR) points. Ink Plus (Visa) – This is a newer card to me. I’ve already gotten my 60k UR points, but I like shopping at office supply stores, so I keep it in my wallet. Ink Bold – I recently called about my annual fee and got a retention bonus offer to spend $5k and get 10k UR points if that $5k is spent in 3 months. I’m about a month in, I’ll meet it, then the card will become a back-up. Suntrust Delta Skymiles Debit – I don’t think there’s a whole lot to say about this card. This is in my wallet purely for MS reasons. American Express Business Platinum – I probably need to start thinking about getting rid of this card, but I got enough value to offset this year’s annual fee. Come next April, I’ll jettison it (unless AMEX can convince me otherwise). Until then, I’ll enjoyed the no foreign transaction fees, access to Centurion Lounges, and the Membership Rewards; but I don’t use it terribly often. American Express Blue (aka Old AMEX Blue), 1%/5% after $6,500 at supermarkets and gas stations. Its not a bad back-up card, and my first go-to when I’m at a supermarket (for MS or otherwise). If only I got 5% at Costco, then I’d be doing really well (hah!). Barclay Arrival+ – So this is my lead-off card. My goal next year, is to generate enough rewards with the 2.2% cash back, to cover generation of my status and most of my wife’s (she travels for work a bit which covers a handful of the 100k requirement for Executive Platinum). Right now, I don’t have any minimum spending thresholds to meet. If anything, its the Chase Ink Bold to get the retention bonus. So, I realize I’m at a disadvantage because I’m not working toward a minimum spend threshold. I’m actually a few weeks off of my next churn, but really at a loss of what to bother with, other than maybe an Ink and an Alaskan card. But really, my focus on this blog has been less on sign-up bonuses, and more focused on how to leverage cards that you already have in your repertoire. The problem is, that for many cards, the bonuses are great, and then, really they just sit in my drawer until its time to cancel or negotiate for a retention bonus. So my post on Pursuing United MileagePlus Miles through Manufactured Spend on either the Barclay Arrival or United Club Card (or Chase Sapphire Preferred) got some great comments and feedback. I’m grateful for the feedback, whether it comes via comments on the blog or via twitter. So I thought I’d dive a little deeper. In my last analysis, I didn’t incorporate a spend threshold bonus. 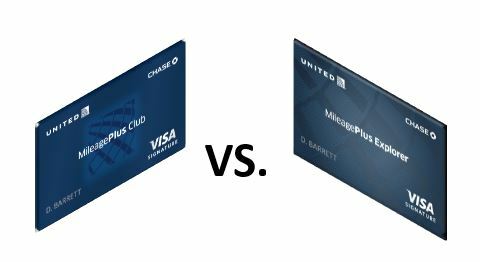 United Club Card vs. United Explorer (same as Chase Sapphire Preferred). United Club Card vs. United Explorer at $25k Spend. With the above chart, I’ve went ahead with the assumption that you’d spend $25,000 on the particular card. I’ve used the “direct buy” cost of 3.76 cents per mile, then subtracted the Annual fee, $395 for the Club Card, and $95 for the United Explorer. You can see that at that spend level, you’d get more miles, but less “value” with the United Club Card. For the United Explorer, you get more than $200 more “value” for 2.5k miles less earned. What this further match-up tells me, is that you’d need to spend roughly $28.7k on the United Club Card to match the same value that $25k spend gets you on the United Explorer. That said, beyond $28.7k in spend, you’ll be generating more value with the United Club Card. Its clear though, spend thresholds matter, but for them to be truly meaningful, you need to be prepared to meet that threshold and shift your spend to other cards immediately.